Importance of Power Systems Studies and How it will save 1000s of dollars? We had previously written an article about the importance of Arc Flash Hazard Analysis. If you haven’t checked it out, please click below. It will help you to grasp the information available in this article easily. What is a Power Systems Study? In order to perform Power systems studies, design engineers and power systems engineers are required who must have a high degree of understanding on proper application as well as a depth of understanding on power systems. 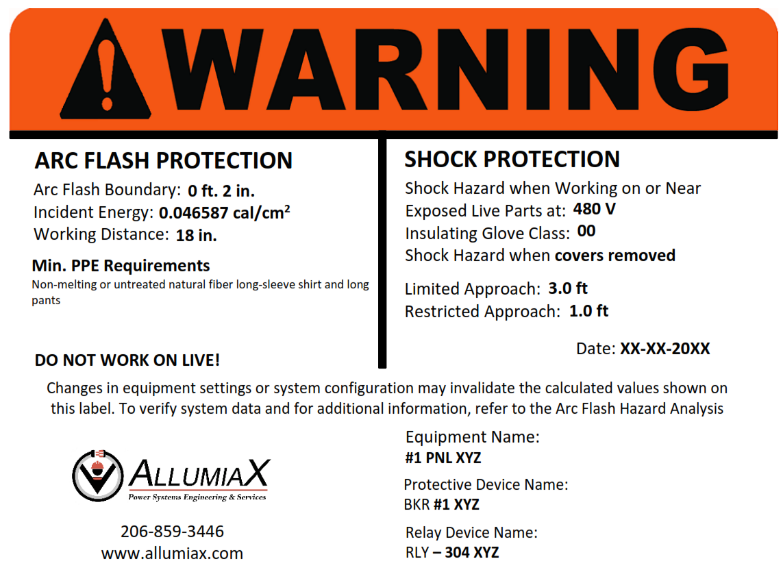 AllumiaX has available a group of Professional Power Systems Engineers that provides the high quality Power systems studies including Arc flash study with Arc flash Stickers and recommendations. Please check out our Auto Quote tool to get the desired price for your facility. To design the Protective Devices, as well as to investigate the ability of the system to handle small and large disturbances or faults of any kind. Why do you need a Power Systems Study for your Facility? 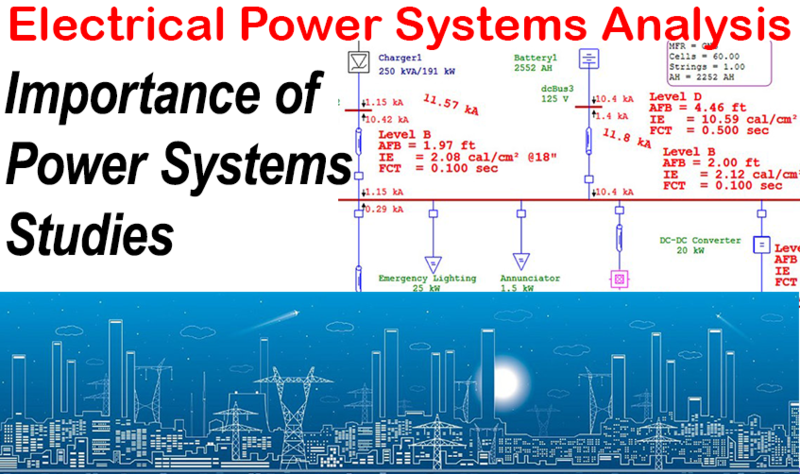 Power systems study is very important for the protection of power systems. In order for a reliable operation of the protective devices at the time of Short circuit, or any fault current, you may need a power systems study. But, no one does a complete suite of power systems studies at the same time. 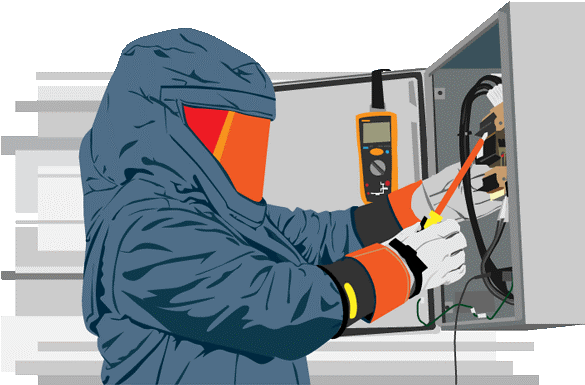 Usually, over the life of a facility, you may need a complete Arc Flash study every 5 years as recommended by the latest standard of NFPA 70E 2018 and OSHA requirements for the electrical safety of every employee in the field. Usually, Arc flash study consists of all the major power systems studies that are required for any power systems facility (It may be Hospitals, Power plants, Clubs, Industries etc. ), so if you perform Arc flash study with the recommendations, then it will cover most of the part required in the power systems study. As we already know that the reliable and safe power systems are critical for any successful operation. A well-designed power system ensures robust performance and maximizes plant availability under all operating conditions, including transient conditions like motor starting, non-linear loads and generator loss. Effects of poorly designed systems including outages, faults, poor power quality and Arc Flash over can results in a significant loss, or worse, personnel injuries. What happens when all your lights are nice and bright and suddenly, they flicker throughout your facility? When your motor abnormally heats or is replaced multiple times due to heat? The voltage of your facility sags or swells for a short time then returns back to normal? Enter the world of Power Quality. Over the recent two decades, electrical efficiency has greatly been achieved across all products and equipment. LED lights, incredibly small power supplies, inverters, variable frequency drive -- all of these have one thing in common. They produce dirty power littered with harmonics. In a sense, harmonics are a measure of the quality of power and they are additive. For example, suppose we have a dozen LED lights in our facility. These lights produce a trace amount of harmonics - so little, it's hard to even measure. But instead of a dozen LEDs, we have millions of LEDs installed. The trace amount of harmonics will all add up and create a significant power quality challenge. That's just one part of the Power Quality puzzle. Voltage Sags and Swells, resonance problems, flickering, etc. - are all examples of power quality problems. The combination of the internal power system with the facility loads makes every system unique. Power flow studies also are known as Power Quality and Load flow studies which are conducted to determine the voltage magnitude and the angle at all the buses and active and reactive power flow over all the lines and transformers under steady state. The power flow studies cover load forecasting, planning studies as well as operational studies. The first part is performing the short-circuit study or fault study which is required to determine the magnitudes of various types of faults that may hypothetically occur in our facility. This includes 3 phase faults, ground faults, line-to-line faults, and line-to-line-to-ground faults. These faults are simulated under many different scenarios and operating configurations of our system. Short-circuit studies get conducted to investigate the behavior of the system under fault conditions –various kinds of failures and at different locations. The primary goals of these investigations are to determine relay settings and coordination, to design grounding system, to find out the current interrupting capacity of circuit breakers and to calculate current limiting reactors if required. Certain events and situations such as lightning strikes, switching operations and fault conditions occurring in day to day operation of a MV or HV power system in a commercial or industrial set-up may give rise to voltage disturbances, more commonly known as Transient Recovery Voltages or Switching Transients. They in their first occurrence but repeated exposure to these transients will reduce the lifespan of power system equipment and may also disturb the stability of the power system putting the entire installation at a risk of shutdown or failure of certain critical equipment. Stability studies get carried out so as to ensure system stability on the occurrence of faults and after their clearance. These kinds of investigations cover rotor angle stability and voltage stability. Small-signal stability analysis is concerned with power system stability when subject to small disturbances. Performing small-signal stability analysis is a major task in power system analysis so as to evaluate the power system under the certain operating conditions. During the final stages of the planning and design of an industrial facility, it becomes imperative to know about the optimal operating conditions and the peak demand. During the commissioning & expansion phase, there is a high chance for the generating station to operate outside its specified power limits. Power blackouts can occur if proper loading conditions are not determined, causing major losses to utility companies worldwide. A load flow study can be used to demonstrate the performance of the system under normal and emergency conditions. It is a steady state analysis of the electrical network which identifies key areas for improvement in loading conditions, thus ensuring safe operation of the power system. There are many softwares available for performing Power systems studies. Different companies use different softwares according to their budget, comfortability, usage and set criteria.